Melbourne Law School Family Law lecturer Professor Belinda Fehlberg said addressing family violence requires cultural change and that underlying issues need to be addressed and initiatives appropriately resourced for meaningful change to occur. "As Royal Commissioner Marcia Neave has suggested, these are issues that need to be addressed on a very large scale, like drink driving, to lead to a cultural change of zero tolerance. There are much deeper issues here, including women's lesser power generally compared to men, mental health and substance misuse issues, and social-economic disadvantage. Family violence is the tip of the iceberg; it is symptomatic of - and related to - a range of other significant social issues," Professor Fehlberg said. "We are seeing increasing awareness of the significance of family violence and commitment to change, which is great. However the issue of adequately resourcing family violence initiatives, including crisis, early intervention, and prevention services, is of ongoing concern. Short-term political gestures that are not backed up with adequate resourcing and long-term commitment to fundamental change are not the answer," says Professor Fehlberg. 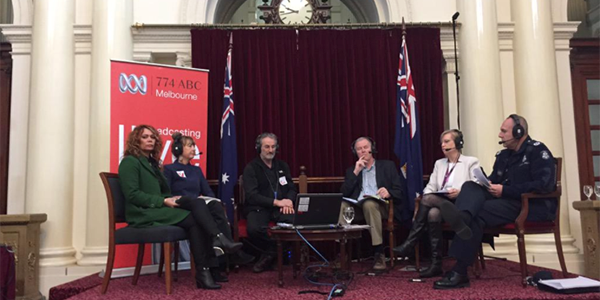 On Monday May 25, ABC 774 radio presenter Jon Faine facilitated a forum on family violence broadcast live from Queen's Hall at Parliament House Victoria. Minister for Women and for the Prevention of Family Violence, The Hon Fiona Richardson MP said family violence affects everybody. "It corrodes the single most important unit within society – the family unit. The Commission will look at the system from the ground up to bring about fundamental reform to keep women and children safe in their homes," said Ms Richardson MP. "We have a unique opportunity with this public conversation that's started to happen, to make a real difference," said Assistant Commissioner Dean McWhirter from Victoria Police's Family Violence Command. Other forum panelists debated whether, in the long term, government action would be enough, arguing that the problem stems from gender inequality in Australian society and that views towards women need to be looked at. CEO of Domestic Violence Victoria, Fiona McCormack said, "Attitudes towards women need to change for any lasting impact on the statistics around family violence. Hopefully the Royal Commission's findings can help to further progress in this area but a holistic approach is what's needed." Director of the Centre for Innovative Justice, Rob Hulls agreed, speaking about the benefits of helping men to address why the violence is perpetrated so that they can behave in ways that do not affect the safety of women. "Early intervention programs and behavior change groups, when implemented early enough, help stop violent abuse and women report greater safety around their partners," explained Mr Hulls. Adequate funding is an integral issue to bring about systemic change. The panel agreed that Australian of the Year Rosie Batty and her story was an important part of shaping public perception on the issue, and that the work of the Commission will help provide safer homes. Ms Richardson MP closed the forum with the benefits to society of better attitudes towards women and greater gender equality. "The consequences are severe for women and children. Societies with better attitudes towards women and children also enjoy lesser rates of family violence. That's what we are aiming for."